Happy Trails nerf bars and skid plate were applied to Joel’s KLR the night before our ride. Thanks to Ed for making that come together in spite of not officially having all the parts in stock. Joel used my faux dremel to clean up some plastic edges then accidently touched it on the windshield for the final, finishing touch. I had to tease Joel about loading so much. “Just testing the setup,” he explained. Whatever. I know those bags are stuffed with lovingly packed hors d’oeuvres from Jill. We followed back roads instead of the Interstate west. I wanted Joel to appreciate that the Boise area can be pretty too. This route would involve crossing Succor Creek a couple times. It wasn’t looking good. This was a little splash on the wheels last time through. We stopped to assess our options as a couple ladies on horseback approached from behind. “I got my foot wet,” the nearest lady said, bending her ankle to show us how deep the water was on the horses. The lead horse refused to cross here. “What’s the best way to Succor Creek Road?” I asked between shared remarks on the beautiful day. We obviously weren’t going this way. We didn’t get much of an answer out of them. “I think they hated us,” I said to Joel in a low voice as they rode away. Between squints at the tiny GPS screen and good old-fashioned dead reckoning, we didn’t lose too much time on our way to Succor Creek State Park. I have wanted to stop here and poke around before where Succor Creek cuts into the overhanging cliff. Joel and I had nothing to add. We all gotta pee sometime. It was a short break. This overlooks Succor Creek State Park from the opposite end. The forecast called for wind gusts up to 50 miles per hour. I don’t think we experienced any that strong but combined with the freshly graded, thick gravel, it was entertaining just keeping to the Leslie Gulch road. We stopped for a brief hike among these peculiar formations. Jess and I came across this partially hidden memorial on an earlier hike. I went to show Joel and was surprised to find it broken. Who would do such a thing? I think they look like eyelids. Creepy monster eyelids. I know it isn’t his favorite thing but he agreed to pose. We sat here a bit and comtemplated our odd surroundings. “Let me get another picture to make Jesse jealous,” I requested. Jesse was supposed to come along for this ride. We kept adjusting the timing to accommodate everyone’s schedules but in the end Jesse decided school was more important. What a lamer. There must have been a little cloudburst above the cutoff to Mogogany Creek. It was a slow-going, legs out affair avoiding a nap in the mud. Last time through I circled far around this farm, through which is the most direct overland route to Jordan Craters Road, on the assumption it was occupied. Well, turns out it isn’t. There were no signs or gates to ward us off so Joel and I stopped for a look then continued straight through. I was worried that Mahogany Creek might be running as high as Succor Creek so I let Joel go first. Two inches of water we can handle. Here we have Joel “Runs with Cows” Abbott. He did a little loop out among them—kind of became one of them. As the bird flies, this should be a pretty good shortcut (cue rolled eyes from my wife). My first time through was a little challenging but I’d had time to study the map and GPS tracks for this second pass. We have skipped ahead a bit because I saw things getting a little messy ahead and gathered momentum just to launch myself into an axle-deep quagmire. So I stopped and waited for Joel to offer his help. It seemed like it took him a long time to offer while I stood in my waterproof boots watching him in his non-waterproof boots. It doesn’t look bad but the GS was having none of it. Althought the KLR is twice Joel’s previous bike I was happy to demonstrate that it’s still better in the mud than a GS. I felt bad about laying a track like this through somebody’s field but by the time conditions were obvious we were close to being across. Mea culpa. 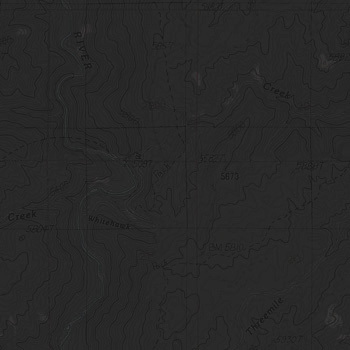 Do not be deceived by the line called Magogany Creek Road. It was put there by a nefarious Delorme employee to crush spirits. It’s just a creek and cow pasture. Fences and ponds turned us around a few times in spite of this being Plan 2.0. But I am steadfast in the conviction that it’s a shortcut. Third time will be perfect. Promise. The wind that nearly blew us off the Leslie Gulch Road was felt again, coldly, as we passed by the fog shrouded Jordan Craters lava field. Perfect: we have four wheels between us. Everything in the ride so far I’d seen but down to the Birch Creek Historic Ranch I’d not been. That’s a good pose, there. The contrasting rocks caught my attention. I guess that’s Birch Creek. I waved Joel by so I could capture this dramatic water crossing. Well, it might have been dramatic if not for that speed limit. How did your feet get wet? —the question I didn’t ask. We were glad to see abundant fuel. The Owyhees don’t always provide much. I used the excuse of recent surgery to defer to Joel for the wood cutting. He did good work. 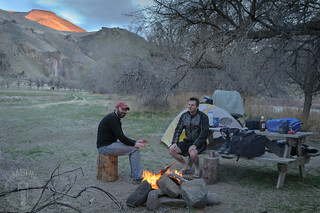 In our different brother rides, we couldn’t remember arriving at a campsite with so much remaining daylight. Now what do we do? I decided to explore the cliffs. The large crack in the rock that I hoped might be the entrance to a fantastic cave instead was a hollow that, judging by stacked rock walls, had long ago been used as a corral. I saw a big rabbit over here but it could scramble a lot better than I could. I wonder what the story of the perch and chain is. Once your eyes adjust to the subtle desert colors, the rocks up here are pretty spectacular. I felt like a kid in a candy store as I climbed around these rocks. It was clear every nook and cranny had been repeatedly picked over for thundereggs. Little round hollows signifying their absence were everywhere. Joel appeared unmoved from the fire as I made my way from the cliffs back to our camp. Continued wind made a hungry fire. Another one to make Jesse jealous. We never planned for Jeremy to come — we knew he was busy — so he’s off the hook. “I have to get your KLR with that sunset behind,” I explained. And with that sock hanging there—so beautiful. We awoke to a glorious morning, threats of rain having never materialized. This was a quick trip for Joel. Later in the same day he would need to head three hundred miles back to Moscow for work the next morning. After Succor Creek, Leslie Gulch and Birch Creek, Jordan Craters would be our last big stop. Ironically, it’s one of his better smiles. From the parking lot, this pair of craters look like small holes compared to the main Coffeepot Crater. Up close, it’s another story. Joel noticed the rocks at the edge overhang the cliff and stepped back. I was trying to take some pictures and wasn’t worried about it until then. After he did that, I got nervous. Darn it. For a sense of scale, that’s my shadow in the ring of light on the far crater wall. It’s a big hole. From Coffeepot Crater we headed south to circumnavigate the lava field. We stopped for a look at the stone corral near Mud Lake. It’s about what you see. The path hugging that western tongue of lava was fun, though it took discerning eyes to see there was a path. Our time between Leslie Gulch and Jordan Valley went something like this. From the stone corral we followed a somewhat discernable path along the edge of the lava. It was quite enjoyable. This house near Biscuit Butte surrounded by lava piqued our curiosity but we didn’t take time to investigate closer. Our thoughts were on burgers and fries in Jordan Valley. I noticed he was wearing a muscle shirt and asked him to flex. This looks across the Snake River to Boise, home for me and the start of Joel’s trip home. I fly by Jordan Craters about once every month for work when I get to look down and remember the great ride I had with my brother Joel.